Enjoy a full day tour discovering the cultural and historical contrasts of the city, before being enthralled at Durban's hottest attraction; uShaka Marine World. - Drive along the 'Golden Mile' (Beach front area). - Visit the Phansi Museum - home to a collection of Southern African artifacts and traditions, including beadworks,headrests, Zulu clay pots and various other treasures. (Closed on Sundays). - Stop at Durban's Botanic Gardens, founded in 1849 and home to a fine mix of African, Asian and American trees. - Discover the rich Indian history of Durban and enjoy a taste of the unique 'Bunny Chow' cuisine. - Enjoy the spectacular and entertaining dolphin, seal and penguin shows. Experience traditional Zulu culture & customs at the largest Zulu kraal in all of Zululand, packed into one exhilarating day. - Sample some traditional Zulu beer. - Enjoy the grace and energy of the Zulu dancers. - Witness the skill and artistry that goes into spear, shield, beadwork, pot making and the building of their huts. - Visit an iSangoma (witchdoctor). - A delicious lunchtime feast is included. Spend a day on safari in the magical Hluhluwe-Imfolozi Park, the oldest proclaimed reserve in Africa and famous for its	highly successful white rhino conservation program. 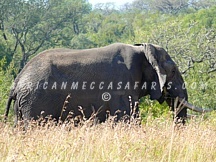 - The reserve is home to 84 species of game, including the 'Big Five'. - There is an impressive 425 different types of birds,at last count! - Lunch at Hilltop Camp (or similar) included. - Hilly terrain affords some of the most incredible views over the reserve. - Game drive in an open safari vehicle. For those with a sense of adventure, a 4x4 drive up the highest road pass in Africa will certainly provide you with a small dose of adrenalin. For your efforts, it will reward you with its breathtaking scenery. Note: Passport is required & visa conditions may apply. 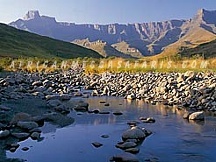 - Drive through the rolling hills of the Midlands to the town of Underberg. 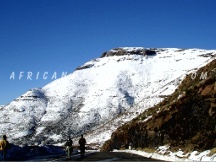 - Board a 4x4 vehicle, the only means by which to tackle the Sani Pass. - Enter the Kingdom of Lesotho - another stamp for your passport! - Visit a nearby Sotho Village, for a taste of local culture. - Enjoy a light lunch in the highest pub in Africa, with incredible views. - Visit the magnificant Howick Waterfall on your return (time permitting). As if the stunning mountain scenery of the Drakensberg Mountains were not enough, our visit to the World Heritage Site of Giant's Castle incorporates a viewing of the enigmatic Bushman paintings. - Enjoy a 3km round trip hike to the site of the caves adorned with the Bushmen's legacy (average level of fitness required). - Guided tour of the Bushman paintings, dating back 2 000 years. - After working up an appetite, enjoy a hearty lunch, which is included. 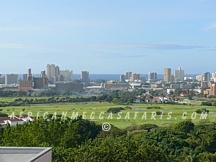 - Return to Durban via the Midlands Meander Route, with its many craft and farmers markets. 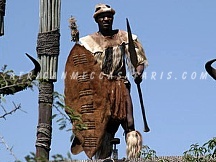 KwaZulu-Natal is rich in Anglo-Zulu war history, where two of the most famous battles fought between the Zulu and British Armies have taken place. 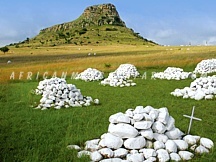 - Visit the eerie battlefields of Isandlwana and Rorke's Drift. - View some of the most spectacular scenery in KwaZulu-Natal. Greetings to you and our most fervent thanks for a wonderful trip of Kenya, Zanzibar, South Africa & Victoria Falls. This was truly a perfect vacation. Thank you so much for all your arrangements. It was a trip filled with different kinds of adventures. We experienced and learned so much. Would highly recommend it to others who are interested in similar trips. Wishing you the very best.